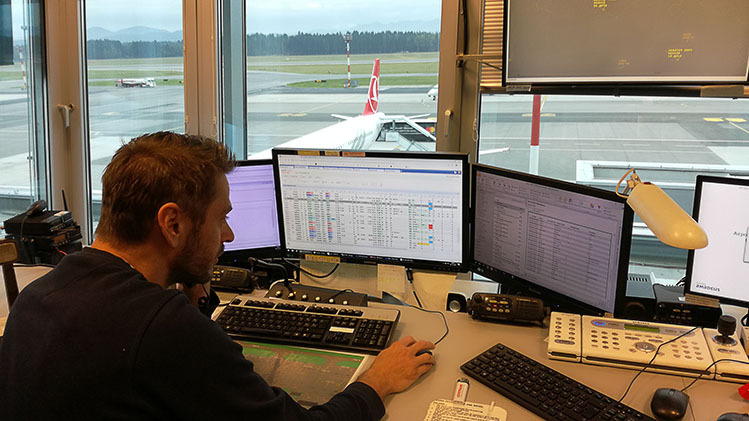 Through the SESAR Related Deployment Airport Grouping (SDAG)’s support, Fraport Slovenija and Groupe ADP have been awarded Connecting Europe Facility (CEF) funding to contribute to the upgrade of Europe’s air traffic management system. Barbora Smolikova reports on the benefits of this funding for the enhancement of airport operations. (SDAG), part of ACI EUROPE, has been playing a pivotal role in helping airports (members of ACI EUROPE) to deploy the technological solutions and procedures that are contributing to the modernisation of Europe’s air traffic management (ATM) system. To date SDAG has supported 20 European airports of different sizes, helping them to secure a total of €189.5m from CEF funding. According to the European Commission’s Pilot Common Project (PCP), the deployment of ATM technologies is mandatory for 25 airports in Europe – those that have the greatest impact in the entire European air traffic network. This means that these airports have to deploy the necessary technologies that will ensure greater harmonisation and efficiency of Europe’s ATM system. However, beyond the PCP, any other airport in Europe, regardless of its size, can – and should – improve its ATM infrastructure as much as possible. The deployment of ATM technologies naturally requires huge investments from airports. For this reason, airports of any size can apply for EU funding, more specifically the Connecting Europe Facility (CEF) funding, which was developed by the European Commission to support key investments in the European transport infrastructure. SDAG can support airports during the whole application process for funding, as an ACI EUROPE membership benefit. This is what SDAG has done with Groupe ADP and Fraport Slovenija, which have successfully been awarded CEF funding. Through the SESAR Related Deployment Airport Grouping (SDAG)’s support, Fraport Slovenija and Groupe ADP have been awarded Connecting Europe Facility (CEF) funding to contribute to the upgrade of Europe’s air traffic management system. The project started in February 2017 and it is due to be fully implemented by December 2020. It is progressing well in line with what has been planned. The first results of this joint adventure are already visible. More specifically, Stansted Airport has successfully completed its part of the joint project aiming at equipping the airside vehicles that have access to the runway and operate in the manoeuvring area of London Stansted Airport with a vehicle transponder, to improve situational awareness, reduce the risk of runway incursions and contribute to the overall airport safety culture. What will be the benefits of the project? In 2015, Fraport Slovenija, operator and managing body of Ljubljana Airport, applied for CEF funding under category “Other Projects” with the project “Initial Airport Operation Plan (IAOP)”. 50% of the project value was granted €445,367. “The aim of this project is to improve the efficiency of airside operations by sharing real-time information data and consequently minimise airport congestion,” Jure Mežnaršič, Advisor to the Management and Boštjan Rakovec, Head of Information Technology explain. Airport congestion represents a limiting factor for traffic growth and air connectivity, especially in peak hours while airlines constantly request speeding-up aircraft turnaround target times. Can you let us know the main advantages of IAOP? The deployment of IAOP will enable Ljubljana Airport to enhance the efficiency of airport operations and especially the turnaround process at the airport by involving all stakeholders. IAOP is based on real-time data exchange between the airport, air navigation services, airlines, ground handlers and other stakeholders to help them work together more efficiently and transparently. It will also allow for better operational decisions and it will be the basis for the future implementation of Airport-Collaborative Decision Making (A-CDM). As a part of the global SESAR Deployment Programme, we think that the outcome of this project at a macro level has to be assessed as an important local contribution to the entire Network. What will the final outputs be? With the implementation of the IAOP, delays at Ljubljana Airport will be reduced up to 10%. This reduction will have a positive impact on all aviation stakeholders, including passengers. The impact will not only be quantitative, but we also expect it to bring some qualitative benefits, locally and network-wide, such as improved safety, better operational performance, higher stability of the network and, last but not least, a seamless passenger experience. Therefore, the airport operator will not be the only one taking advantage from IAOP; benefits will be extended to the whole network, allowing for better predictability for the Network Manager. The project is scheduled to be fully deployed by the end of 2018 when all modules of the new software will become fully operational. SDAG is pleased to provide support to these initiatives and to see how airports’ awareness of CEF funding is increasing from call to call. If your airport would like to know more, please contact SDAG on the following email addresses: barbora.smolikova@ airportgrouping.org and luc.laveyne@ aci-europe.org. You can visit the SDAG website (www.aci-europe.org/sdag.html).